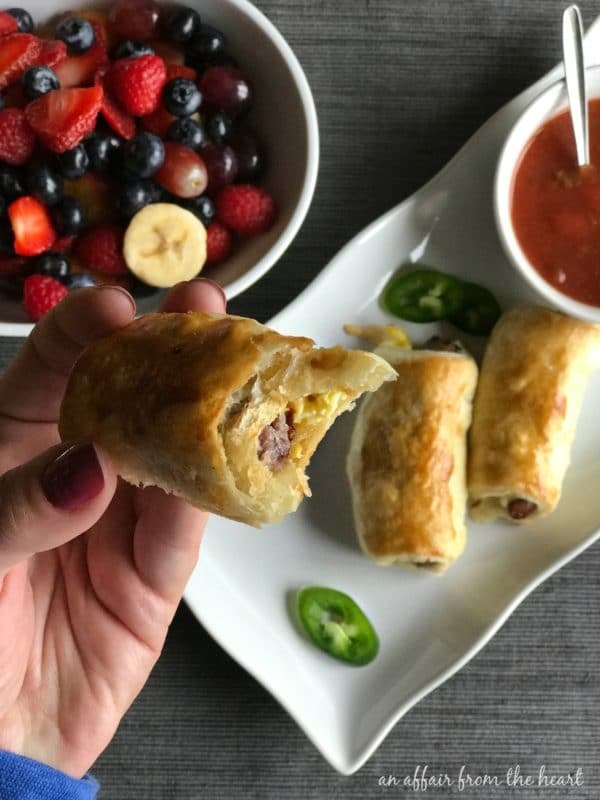 Puff pastry dough rolled around breakfast sausage links, scrambled eggs with green chilies and Monterrey Jack cheese, baked up til golden brown and flaky. Easily made ahead. Thank you for supporting the companies and products that make An Affair from the Heart possible. Adding sausage links into breakfast dishes is every hostess’s secret to a successful brunch. Easter time, Mother’s Day, Graduations … perfect time for throwing a brunch. The worst thing about hosting a brunch, or any get-together really, is when the hostess gets stuck in the kitchen cooking while everyone else is having fun. That’s happened to me too many times. I guess you could say I have gotten smarter with age. 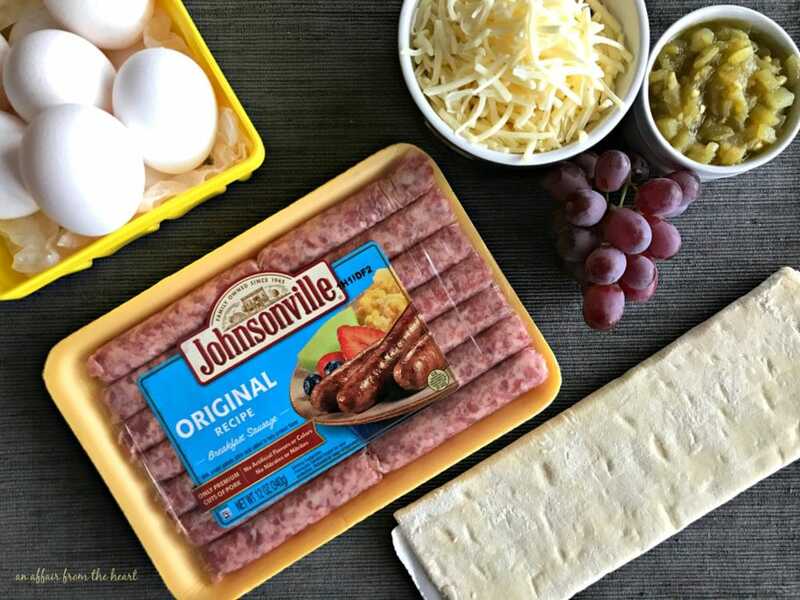 Our family eats Johnsonville breakfast sausage all of the time. 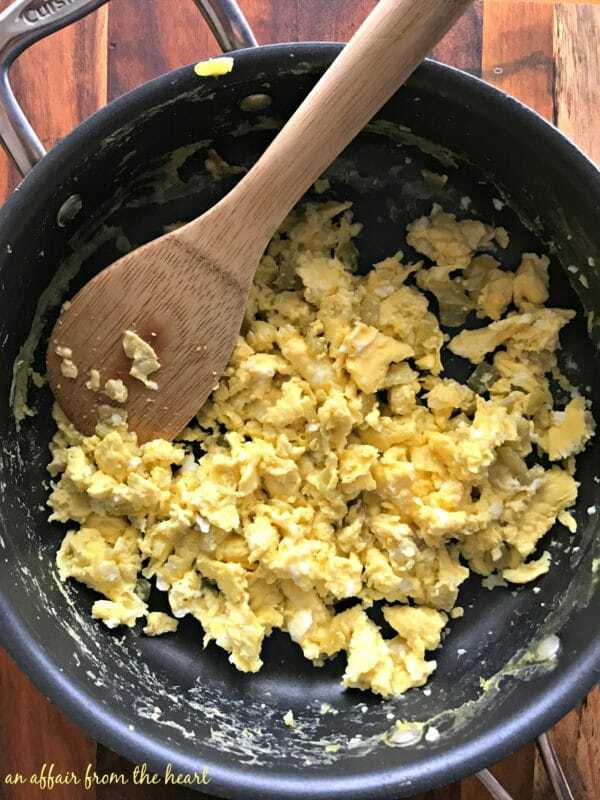 We make a big breakfast every Sunday, and whether it’s simple eggs and hashbrowns or my hubby’s famous French Toast, they are easy to make and will accompany any breakfast food nicely. 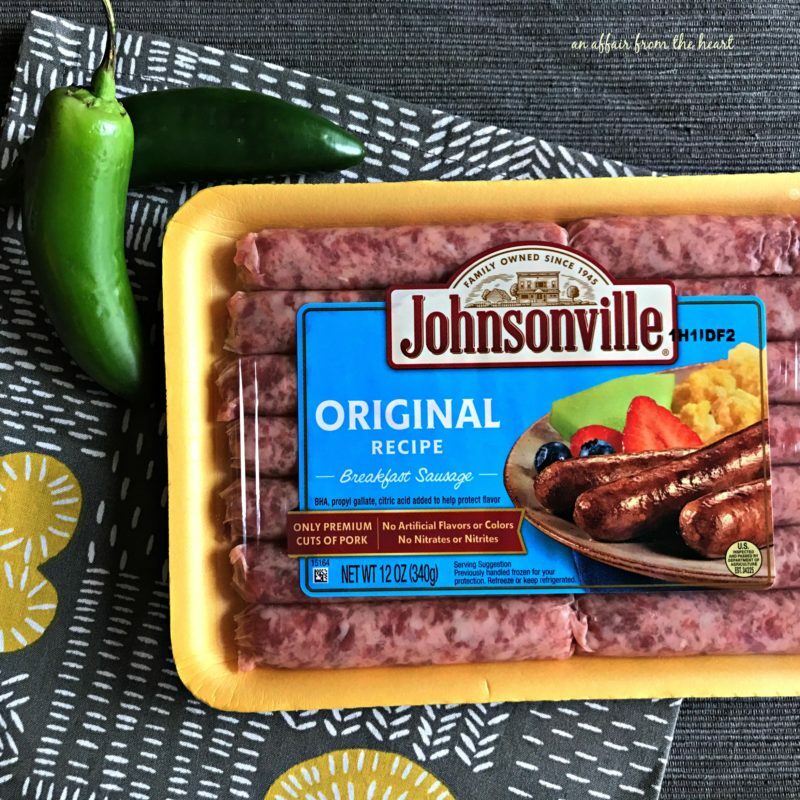 Johnsonville sausage is made the Johnsonville Way – from a team dedicated to creating the best sausage in America, with choice cuts of pork and a variety of flavors and spices mixed in. 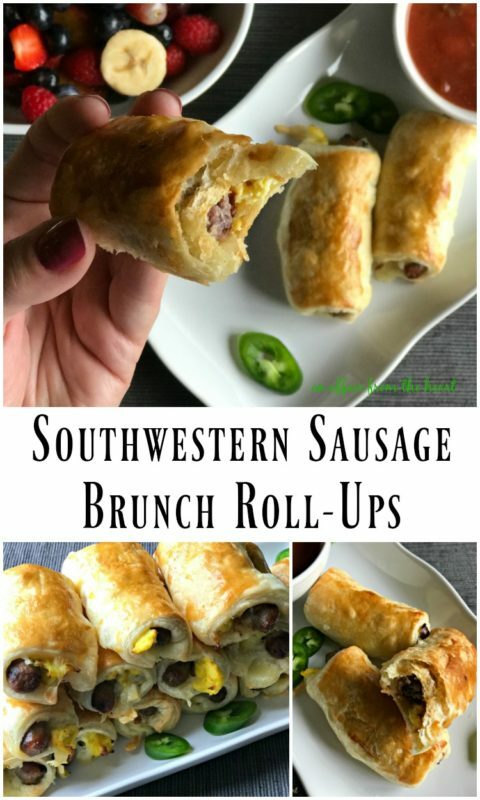 Whether it’s a big brunch or Sunday morning breakfast, your family will LOVE these sausage roll-ups. They were packed with so much flavor! 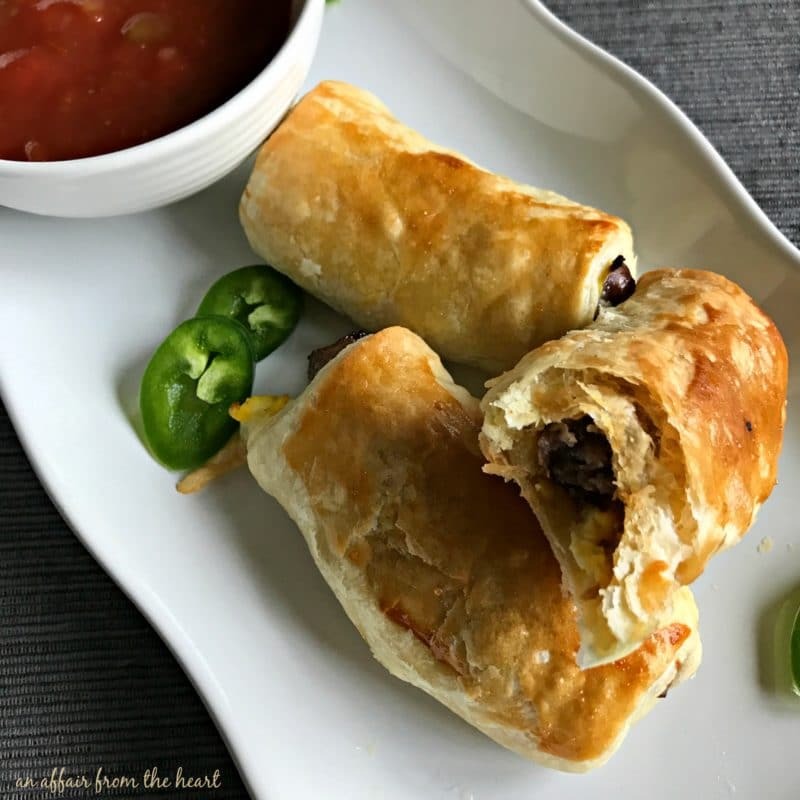 Make them ahead, bake them up and serve them hot with a side of salsa for dipping. Only five ingredients, and you are well on your way to a delicious brunch item. 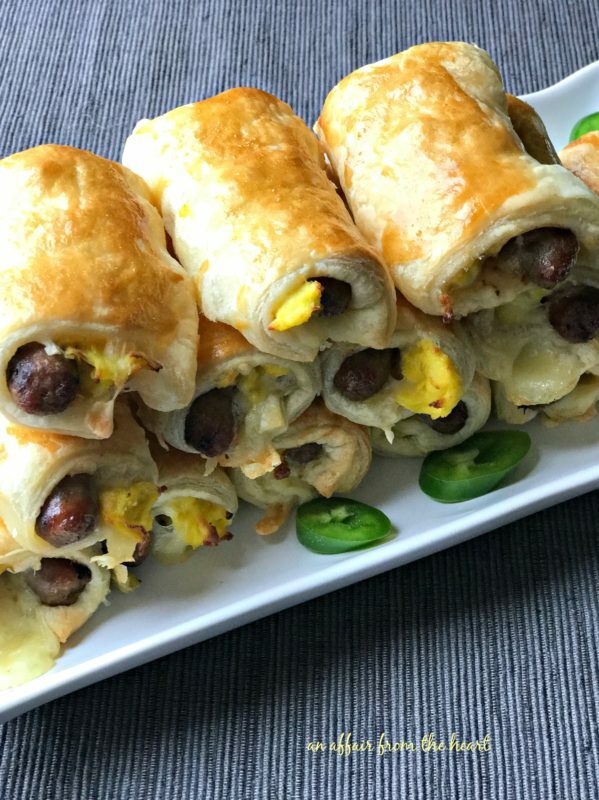 Johnsonville Original Breakfast Sausage, Eggs, chopped green chilies, Monterrey Jack cheese and puff pastry. All of the ingredients are cooked ahead of time. Brown up your sausage. 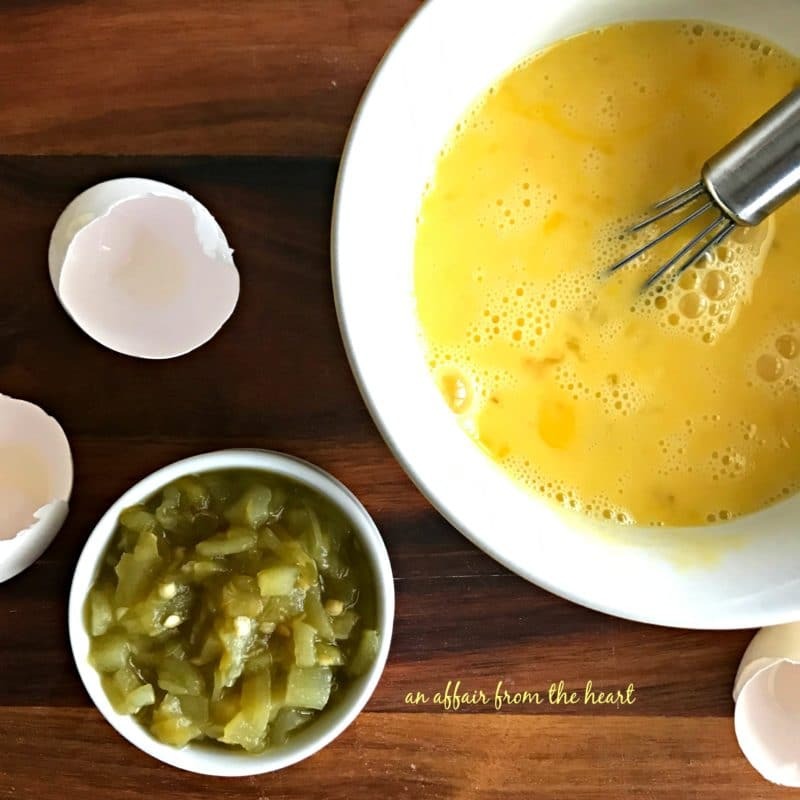 Scramble together some eggs and green chilies. All ready to start prepping the rolls. 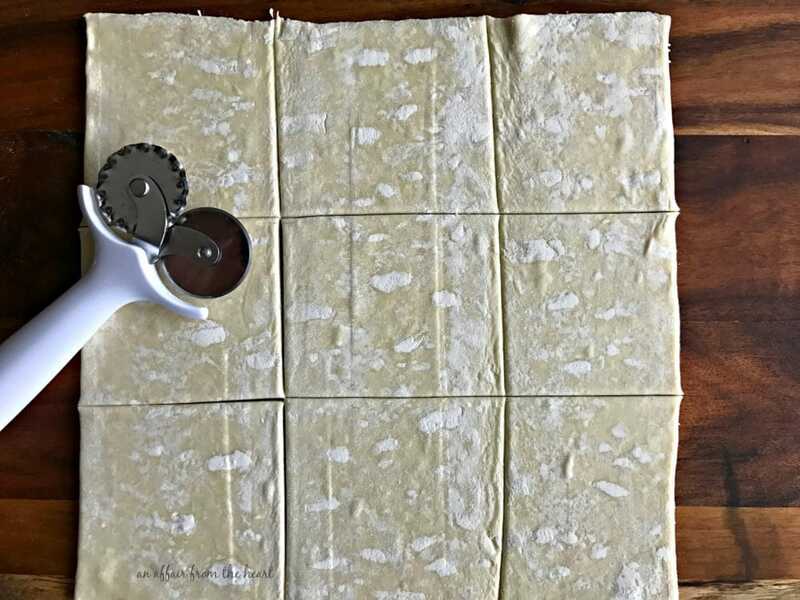 Cut your puff pastry sheet into 9 squares. Add one Johnsonville breakfast sausage, some scrambled eggs and a sprinkling of Monterrey Jack cheese. 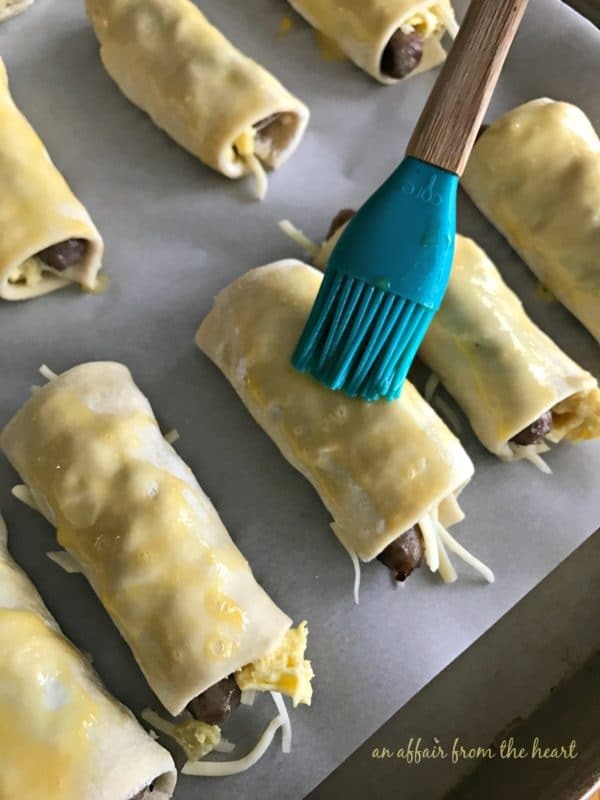 Gently stretch the pastry dough around the sausage and roll up. Place the roll-ups seam side down on a parchment lined cookie sheet. Bake up until flaky and golden brown. Serve with a side of salsa for dipping, if desired. Your family and your guests are sure to rave about how tasty they are, and you will be enjoying them right along side them, because you made them ahead of time! 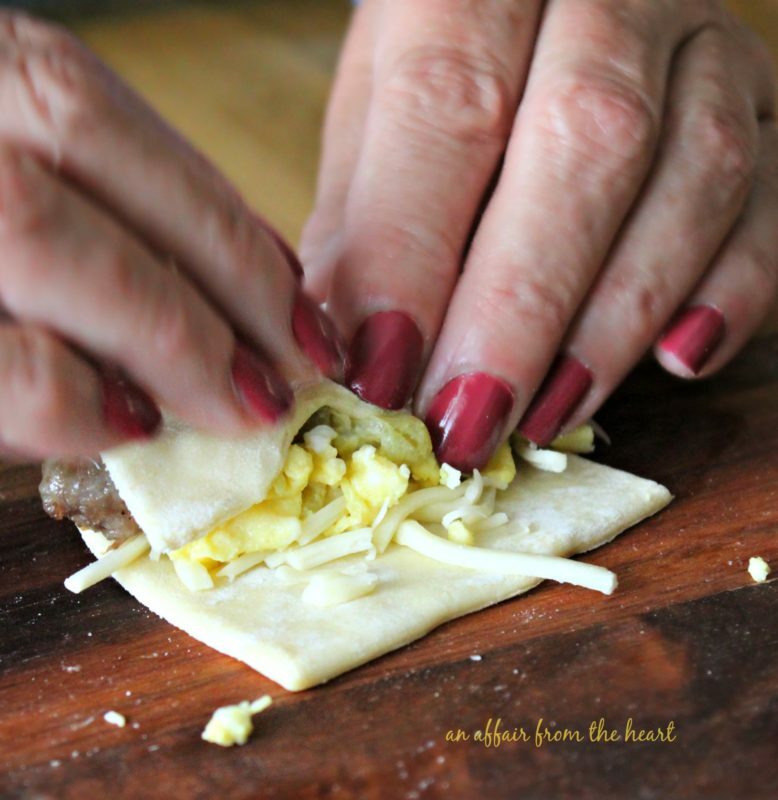 Pastry dough rolled around breakfast sausage links, scrambled eggs, green chilies and Monterrey Jack cheese. Baked up til golden brown and flaky. Scramble together 5 eggs and green chilies. Prepare in a skillet, set aside. Whisk one egg in a small bowl, set aside. Cook Johnsonville Breakfast links according to package. 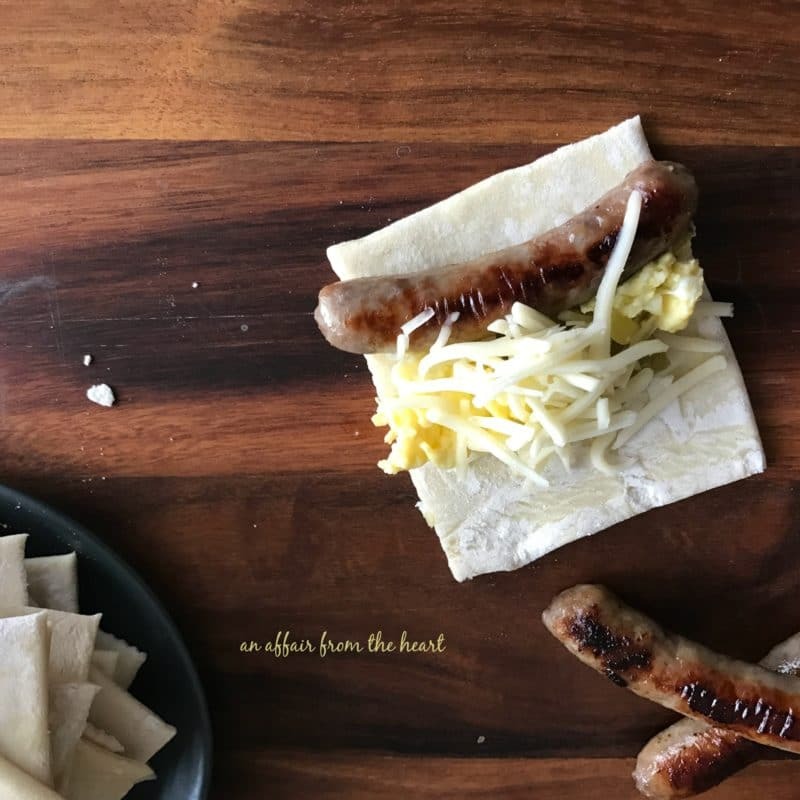 Place one sausage near the edge of one square place a spoonful of scrambled eggs and a sprinkling of cheese over the eggs. Gently stretch the pastry over the sausage and roll up. Place seam side down on prepared cookie sheet. Bake for 12 minutes. Serve hot. Prepare these ahead of time, and bake them up when you're ready! 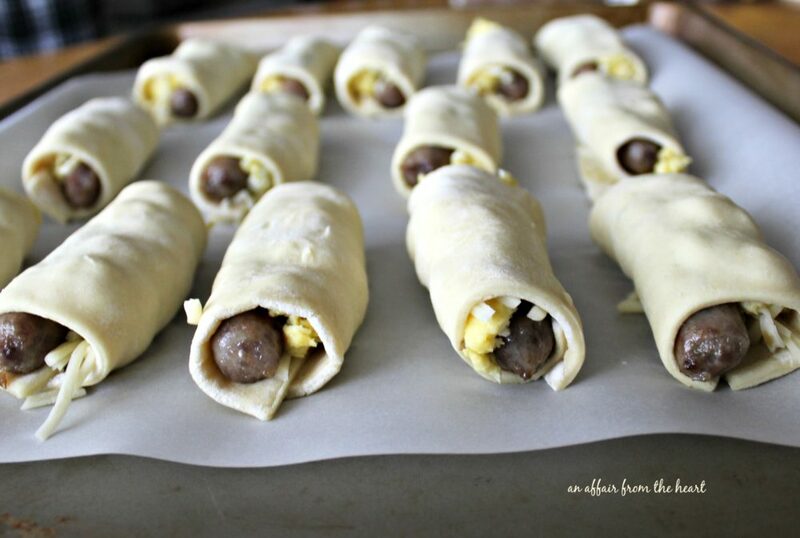 How would YOU incorporate Johnsonville breakfast sausage links into your next brunch? This sounds delicious, and I love Johnsonville sausage! I just love every flavor in this roll up. I’m always looking for those spicy flavorful profiles and sausage and green chilis is a homerun in my book! 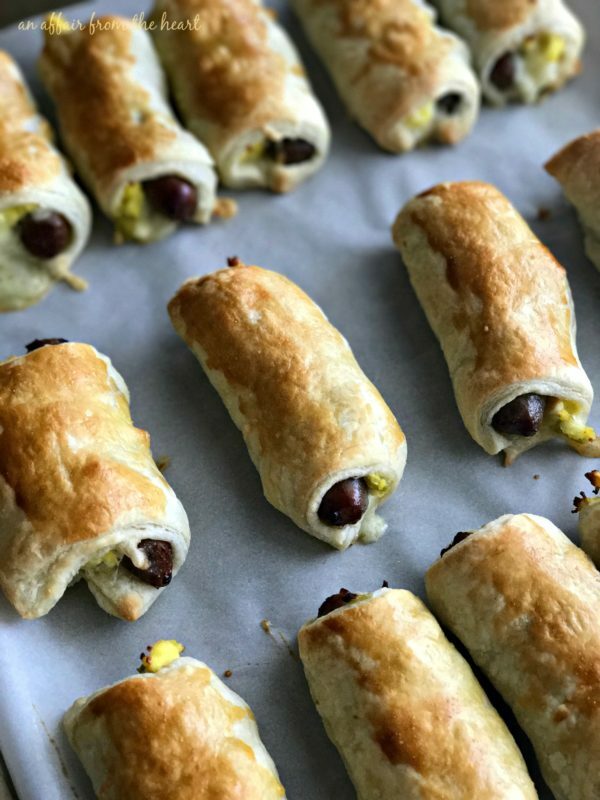 These look like sausage rolls that were common when I was a kid, but with some tasty additions. Definitely great for brunch. Love this kind of breakfast! Pinned! Can these be made the night before? Or made and frozen? 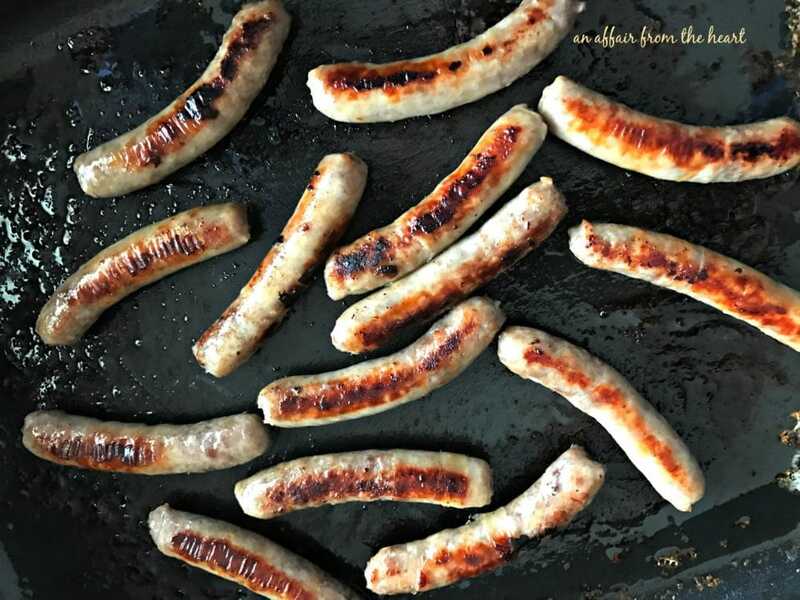 Looking for a Christmas early morning breakfast idea with sausage links! I have never frozen them. It might be best to experiment with that an another day that wasn’t so important? I feel like if you did freeze them, you should prepare them and then freeze? I have an overnight sausage link casserole on here that would work perfectly! Maybe try that instead?